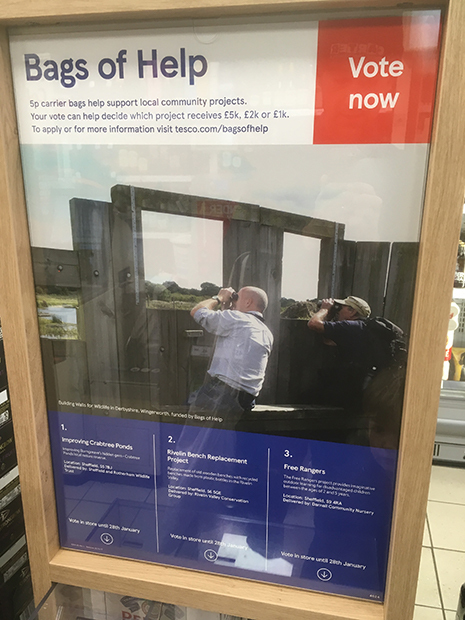 Rivelin Valley Conservation Group are one of the causes that you can support if you shop at Tesco as part of their Bags of Help scheme. When you shop at a store, you’ll be given a token to deposit in a box to vote for one of three voluntary organisations. Your vote helps decide which project receives £5k, £2k or £1k of funding from money raised by the carrier bag charge. The Rivelin Valley project is to replace old wooden benches with recycled benches made from plastic bottles. The other two causes are improving Crabtree Ponds in Burngreave and the Free Rangers project for disadvantaged children run by Darnall Community Nursery. The Manchester Road Tesco branch in Crosspool is a participating venue.